Who will train the next Designers? Lately I’ve been teaching web fundamentals to a group of design students and it’s gotten me to wondering about the future of design education. For decades design education has been something of a Cinderella, the underappreciated, underfunded stepchild of Fine Arts. The universal hope (and very rare reality) was that, when midnight arrived, its true value would be recognized and it would be elevated to its rightful place at Prince Charming’s side – the fairest of all disciplines. The sad fact is that midnight has arrived and the Prince – in the form of online and interactive media – has turned out to be something of a hound dog, bestowing his kisses on a variety of professions; programmers, engineers, journalists, SEOs and (heaven forbid) teenagers. Today, basically anyone who wants to be a designer is one. All it takes is a computer, an Internet connection and desire. Sure there’s a lot of crap out there but there’s also some truly excellent work and a lot of it (perhaps most) isn’t being done by classically trained designers. The question becomes what, if any role does traditional design education play in a world where everyone is a potential designer, where students arrive at college with computer skills (the current tools of the trade) beyond their professors and possibly a portfolio of online work? 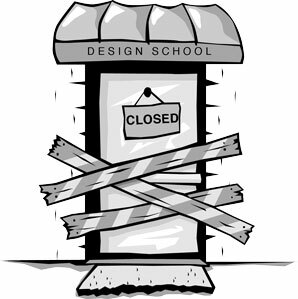 Is there still a role for a stand-alone design curriculum or is the future of design education that it will be dispersed and absorbed as a part of other professional training?